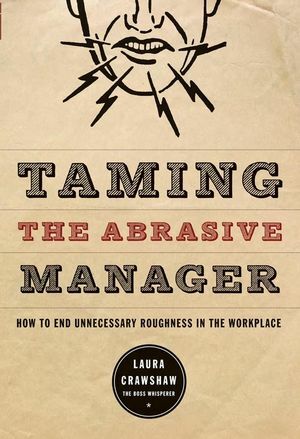 Taming the Abrasive Manager is an ideal resource for managers, human resource professionals, coaches, and anyone who works for or with an abrasive boss. Executive coach Dr. Laura Crawshaw— known as the “Boss Whisperer” for her work in this field—shares her discoveries on how to tame the deep fears that drive abrasive managers to attack their coworkers. In her straight-shooting style, Crawshaw offers invaluable insights gained from her encounters with abrasive bosses in corporate jungles who aggressively defend against threats to their dominance in the high-risk business of survival. These insights, combined with lessons learned from employees and organizations who have successfully reined in their unmanageable bosses, provide realistic solutions that will improve the workplace for everyone. Laura Crawshaw, Ph.D., L.C.S.W. is president of Executive Insight Development Group, Inc., an executive coaching firm specializing in abrasive leaders and dysfunctional teams. She is a member of the International Society for the Psychoanalytic Study of Organizations, the American Psychological Association, and the International Coach Federation. She can be contacted at www.executiveinsight.com. 1. Abrasive Bosses and the Working Wounded. 3. Abrasive Boss Behavior: What They Do. 4. Bears, Bosses, and Business: Survival Through Dominance. 5. On the Origins of Abrasion: Why They Do It. 6. Blinder Than Bats: Why They Don't See. 7. Why We Don't Take Bulls (or Bosses) by the Horns. 8. Can Bosses Change Their (Blind) Spots?. 9. Blinders Off: How Management Can Make Them See. 10. Limits On: How Management Can Make Them Care. 11. Risky Business: Taming the Boss You Work For or With. 12. The Choice to Change: Will the Horse Drink?. 13. Ending Unnecessary Roughness: Preventing Workplace Abrasion. Appendix: Are You Abrasive? (Self-Test).